Plans for a BRT (bus rapid transit) system in Montgomery County will affect Rockville in two ways: Rockville Pike (Clarksburg to Bethesda) and Veirs Mill Road (Rockville to Wheaton). On Wednesday, September 28 from 6:30 to 8:30 pm, the Maryland State Highway Administration will hold a public meeting in the cafeteria of the Montgomery County Executive Office Building (EOB), 101 Monroe Street in Rockville. Parking available in the garage underneath the EOB. The meeting will provide information and gather public comments on the alternatives for BRT service between Rockville and Wheaton. 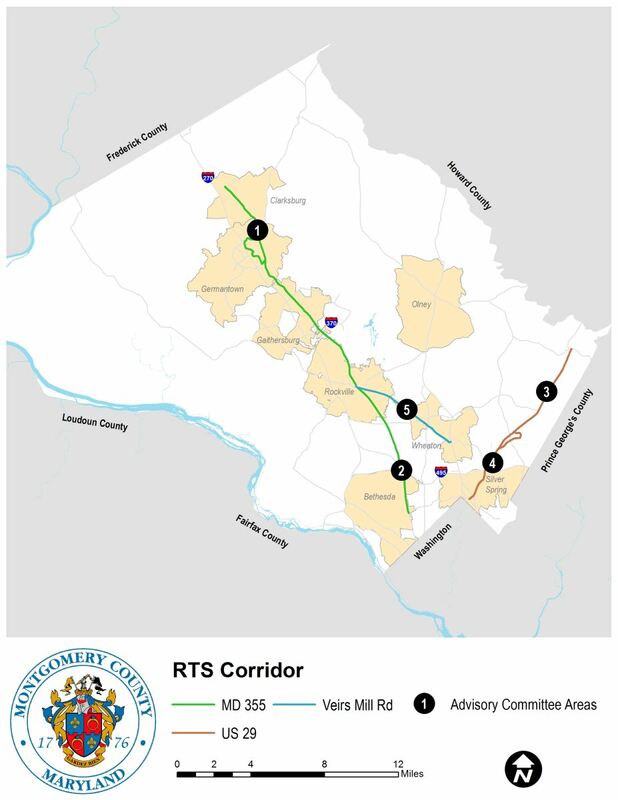 The proposed MD 586/Veirs Mill Road BRT Corridor Study extends approximately 6.7 miles from the Rockville Metrorail Station to the Wheaton Metrorail Station in Montgomery County, Maryland. This study also includes the extension of enhanced bus service from the Rockville Metrorail Station, north in mixed traffic along MD 355, an additional 1.5 miles to Montgomery College. There will not be a formal presentation, so you can drop by anytime to learn about the alternatives, operations, environmental impacts, and cost estimates from representatives from both the county and state departments of transportation. A draft of the recently completed Corridor Study Report for Veirs Mills Road/MD 586 is available. If you are not familiar with BRT, it is a hybrid between a bus system and a train system. There are many different configurations but typically they are similar to trains in that they are larger vehicles running on a dedicated roadway with fewer stops. Like buses, they run on tires not rails, so they can move in and out of the road as necessary. It increases the capacity of the road and reduces traffic congestion and travel time at a much lower cost that light rail or subway, however, it’s unclear if the benefits are worth the costs. At this point, most of the BRT corridors under study are not far enough along in the design process for MCDOT and the State of Maryland to predict the final cost. Issues such as where specifically the stations will be located, whether the BRT will operate in its own separate lanes, in the median, or in mixed traffic, and construction and operation will have critical roles in determining the future cost of a line. Nevertheless, the Corridor Study Report for Veirs Mills Road/MD 586 has estimates ranging from $35-$290 million (in comparison, the expansion of I-270 is funded at $100 million, although no one has figured out how to do it for this low cost). You’ll want to look closely at the tables that compare the various alternatives. Table S-1 shows that travel time would be reduced from 36 minutes to 23 minutes, however, total bus ridership would only increase from 32,000 to 35,000 people per day—that’s 3,000 people. More puzzling, the Level of Service on Veirs Mill Road would be unchanged–almost half of it would still operate at a miserable Level E or F (regard these as letter grades in school, so E and F is failing). At an estimated operating cost of $4.6 million per year (Table S-2), I’d hope we could do better (that’s a subsidy of $4 per rider to attract the 3,000 additional riders). Did I read this correctly? November 2013: After five years of study, the Montgomery County Council unanimously passes a plan for an 81-mile BRT system. The plan consists of 10 BRT corridors throughout the county. January 2015: County Executive Ike Leggett proposes building an ‘independent transit authority’(ITA) to help fund the first phase of BRT — which includes MD355, Veirs Mill Rd, and US29. After intense pressure, Leggett pulls his plan. Spring – fall 2015: Leggett revives a transit task force to study financing options for BRT. In fall 2015, the transit task force recommends retooled legislation for an ITA. Again facing backlash, Leggett withdraws plans for ITA. Spring 2016: This March, County Executive Leggett announced $11.5 million to continue moving BRT forward. Leggett also committed to building a Rt.29 BRT system by 2020. In April, the county released detailed plans for BRT on Rt.29. Currently, the Montgomery County Department of Transportation (MCDOT) is studying design alternatives on MD 355 and Veirs Mill Rd while pushing forward with more detailed plans for BRT along Rt. 29. MCDOT has released its plans for a BRT system on Rt. 29 (which will be the first BRT corridor completed) stretching from Burtonsville to downtown Silver Spring. The system will be 14 miles long and have 12 stops. Rt. 29 BRT is projected to cost $67 million, and the federal government has already committed to covering $10 million of that. The county aims to have the system in operation by 2020. Thanks! You’re correct, it’s the 28th. I’ve made the correction to the post.